Toddlers thrive on predictability and routine. They like to know what is happening next and feel assured when they do. One little routine we have on the days I work is for the Bub to give her grandparents a call before we leave the house. 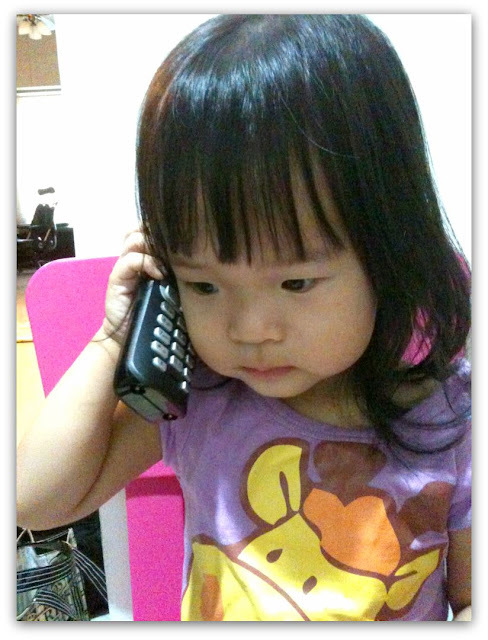 She will say Por Por (or Gong Gong, depending on who picks up the phone), I'm coming! and See you! I find it terribly cute to watch how she listens intently to what they say. She sometimes forgets to articulate a verbal response but instead nods or shakes her head. ﻿Roboman was away for a couple of days recently. On the 2nd night, she must have missed him because at bedtime and said: Call Daddy. Me: You want me to call Daddy? Me: Are you sure? If I call Daddy will you talk to him? After the conversation, she mumbled Daddy come home, before plonking on her stuffed toys. My baby and the phone. The Bub has come a long way since she started tinkering with 'one'. That's so sweet, the part about calling her daddy! i must talk to her again one day... it's amazing what she knows at this age! That must hv been really nice for daddy! Yes, they know so much more than we imagine! Little sponges at this age! I think it should be! He's the type who doesn't easily melt though =P Aiyoh. awwwww B misses dadster loads! She does ask for him when he isn't around when he should be! She is quite a chatty girl! I guess she's developing her linguistic skills first before other skills! I'm sure when your younger kid starts it'll come real quickly!